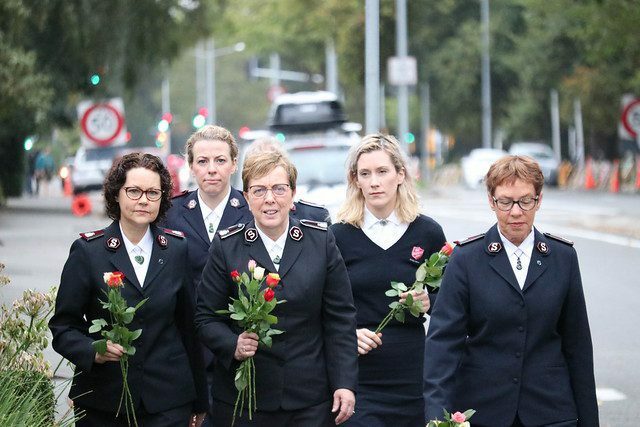 More than 500 women were blessed by the ministry of Commissioner Rosalie Peddle (World President of Women’s Ministries), Commissioner Bronwyn Buckingham (World Secretary for Women’s Ministries) and Captain Krista Andrews (Australia Territory) during a four-day visit that took the three across New Zealand. 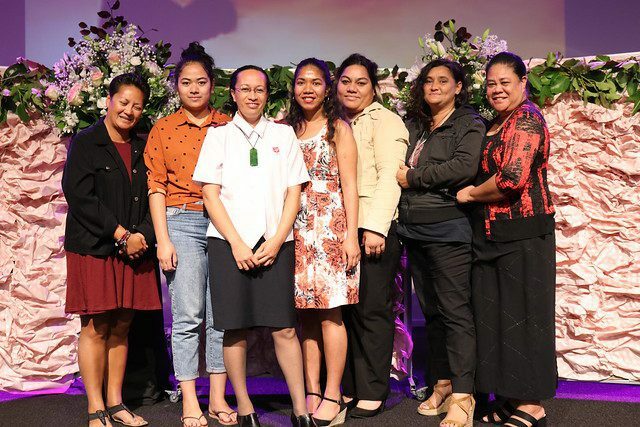 Organized by the New Zealand, Fiji, Tonga and Samoa Territory Women’s Ministries Department, the tour was a homecoming of sorts for the international visitors, with Peddle having served in the Northern Division for two years and Buckingham being a proud Kiwi. The visit began in Christchurch, which was still recovering from the recent terrorist attacks. 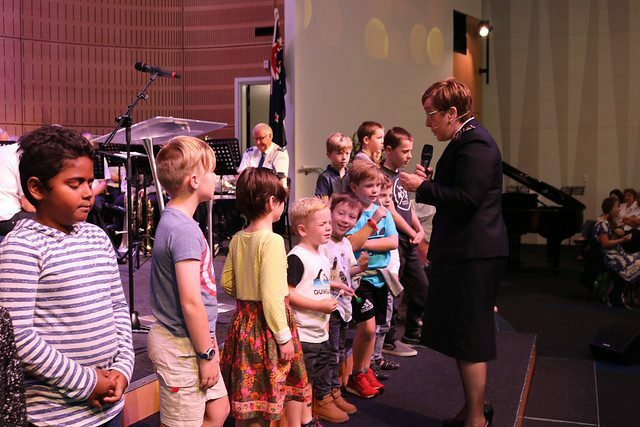 Women from all over the South Island traveled to be a part of the much anticipated event, with 220 in attendance on Saturday before a combined service on Sunday morning. Early on Sunday morning the tour party laid fresh roses outside the Al Noor Mosque where 42 people died March 15. The group stood silently, arms around each other, before Peddle prayed for everyone impacted by the unimaginable actions that had been fueled by hatred. “Help us be the instruments of love and peace; help us to love our neighbor,” she said. She prayed for the city of Christchurch and its people, that they would know God’s love and peace as they begin to rebuild from this tragedy. 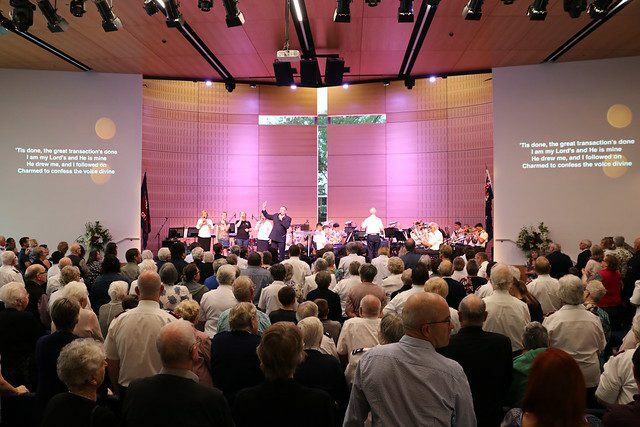 Peddle preached with passion and zeal, whether to an overflowing congregation in Christchurch, at intimate officers gatherings or at public evenings in Wellington and Auckland. Seeing the mercy seats lined with people responding to God’s Holy Spirit was of great encouragement and reflected the hunger for more of God in the territory. Sharing her testimony, Buckingham said how good it was to be home in a ministry capacity since leaving six years ago to serve overseas. 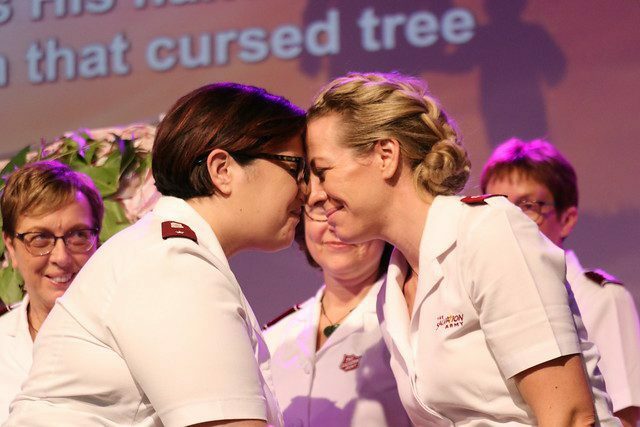 Speaking from her personal experience of the cost of saying yes to God, the commissioner encouraged women to take up their cross and place their confidence in God, who is trustworthy. Andrews ministered throughout the tour with singing and a blend of sign language, dance and mime. “I don’t really know what to call it!” she said. Whatever it is called, it drew people into God’s presence and expressed his great, all-consuming love for them. In Auckland, 42 young women and corps leaders “chewed the fat” over pizza with the international visitors. In moments of engagement and passion there were some tough questions asked back and forth. 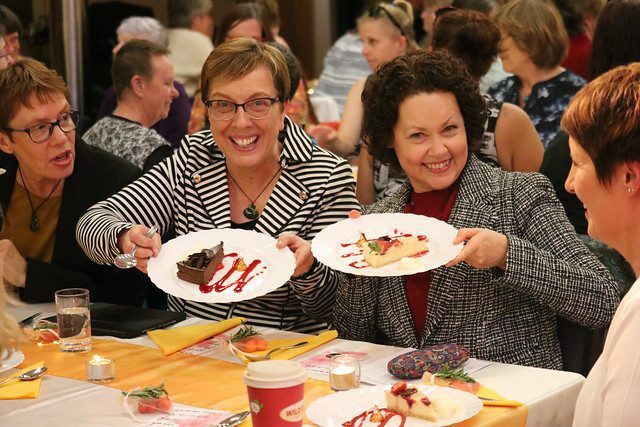 The commissioners both spoke of their heart for young women, and their desire to see change that benefits the coming generation of women leaders. A stunning rendition of “Nau Mai Rā/Welcome Home” was performed as the leaders were brought to the platform to be greeted by the 200-plus crowd. The English version of this song was sung to Peddle when she and her husband were welcomed to the division a dozen years ago.